What happens when you put GoGo Squeez applesauce in a food dehydrator? You get a super easy and incredibly tasty fruit leather recipe! My husband just bought a food dehydrator and I’ve been having some fun playing with different fruits and veggies for the past 2 days. Today I decided to have a little fun with fruit leather (aka: fruit roll ups). When I searched online for different recipes, most of them used pureed fruit or applesauce. That’s when I heard “ding, ding, ding” in my head and this brilliant idea was formed. Instead of making fresh applesauce (because really, who has time for that) or running to the store for a jar of applesauce, I pulled out 3 pouches of GoGo Squeez. Our dehydrator came with the handy plastic trays specifically for fruit leather. All I did was pour out 3 pouches of GoGo Squeez applesauce (you can pick any flavor – or mix it up and have a LOT of fun) on the tray and spread evenly. I could have easily added 2-3 more pouches if I wanted a thicker fruit leather, but this thickness works great. Next, I placed the tray on the food dehydrator and covered. It sat for about 4-5 hours before it looked dry. I sat it aside to cool for about an hour and then attempted the peel the leather from the tray. I was super excited with how easily it peeled off the tray. The final step was to cut the fruit leather in smaller pieces and rolling up for storage. I wish I had some parchment paper for storage purposes but this worked fine as is. Alternative cooking methods for those without a food dehydrator: Bake 3-4 hours at 175 degrees F on a parchment lined baking sheet. This really couldn’t have been any easier to make. GoGo Squeez is 100% unsweetened, all-natural, applesauce in individual serve pouches. Sure you would make this with any applesauce or pureed fruit but we already had these pouches on hand. 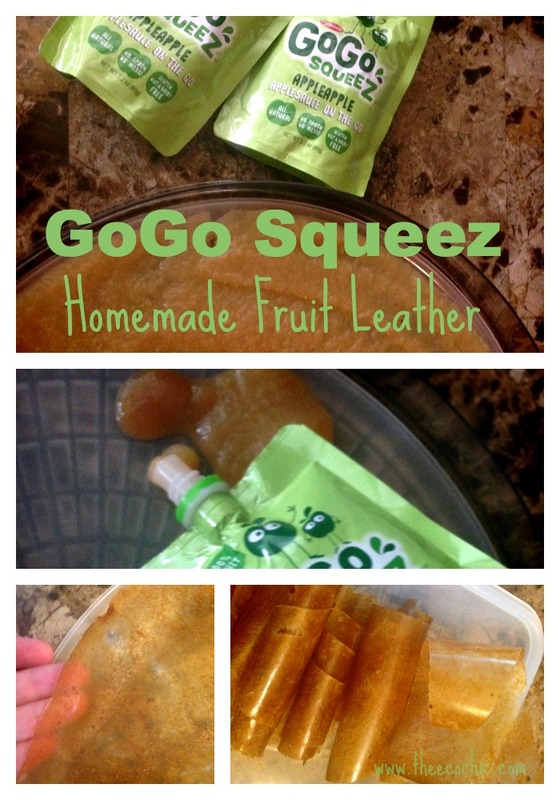 GoGo Squeez comes in a variety of flavors too, get creative and make up any number of combinations of fruit leather for your kids to take to school tomorrow. GoGo Squeez are always kosher, GMO-Free, Gluten-Free, Wheat-Free, Nut-Free, Vegan, and have no colors or dyes added! They truly are awesome-sauce! Disclosure: I have a few cases of GoGo Squeez that were given to me from a friend who works with GoGo Squeez. This recipe/idea is my original idea and was not sponsored by GoGo Squeez. If you love this recipe, please share a link to this page and give credit where credit is due. Peace, love, and awesome-sauce!